Washington Home-Based Business Insurance. More and more people are discovering the benefits of owning their own home-based businesses. Many people edeoy small in-home businesses because it allows them to work part time, arranging their schedules around the needs of their children or other jobs. Other people may decide to go into business full time. No matter the type of business, Washington home-based business insurance is an essential and smart component required for businesses of all sizes. Just because you are home based doesn't mean that someone won't sue you! 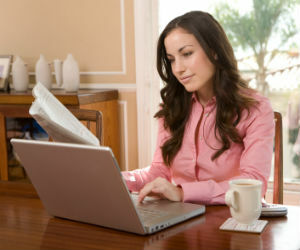 Washington home-based business insurance protects you from lawsuits with rates as low as $37/mo. Get a fast quote and your certificate of insurance now. Business insurance policies protect small Washington home-based businesses from damage or loss of equipment and merchandise and from the fallout of potential claims of liability against the business. What Are Some Insurance Coverage Types For WA Home-Based Businesses? Renters or homeowners policies. The purchase of an addendum on a renters or homeowners policy is often all the coverage a true small home-based business needs. For WA small businesses that do not have a lot of inventory or equipment that requires coverage, this may be the best route. Oftentimes businesses of this nature can find coverage for just a few dollars a month with a rider on their basic renters or homeowners policy. However, this type of coverage does not afford the business any protection from liabilities, so if the business is one that may face liability claims, this option may not be sufficient for their needs. Home business policies. For medium-sized WA home-based businesses with assets from $2,500 to $10K or for businesses that may face claims for ideuries, poor work quality, or property damage, a Washington home-based business insurance policy is an essential purchase. Usually very affordable, this policy provides around $10K in coverage for property and $1 million in coverage for liability claims. Commercial insurance policies. A WA commercial insurance policy is the right policy for large home-based business ventures that require a substantial coverage level for many assets. This type of policy usually offers several options when it comes to liability protection, including negligence and malpractice insurance. It may afford millions of dollars to cover property damage or loss. These are just a few scenarios. There are an unlimited number of ways that WA businesses may find themselves on the receiving end of a lawsuit or claim, and business insurance provides a buffer for the business to prevent financial ruin. What Coverage Does Washington Home-Based Insurance Provide? Liability. Liability coverage guards against loss due to liability claims against the WA home-based business. Liability coverage amounts range from $300K to $1 million. Request a free Home-Based Business Insurance Washington quote in Aberdeen, Anacortes, Arlington, Auburn, Bainbridge Island, Battle Ground, Bellevue, Bellingham, Bonney Lake, Bothell, Bremerton, Burien, Burlington, Camas, Centralia, Chehalis, Cheney, Clarkston, College Place, Covington, Des Moines, DuPont, East Wenatchee, Edgewood, Edmonds, Ellensburg, Enumclaw, Ephrata, Everett, Federal Way, Ferndale, Fife, Gig Harbor, Grandview, Hoquiam, Issaquah, Kelso, Kenmore, Kennewick, Kent, Kirkland, Lacey, Lake Forest Park, Lake Stevens, Lakewood, Liberty Lake, Longview, Lynden, Lynnwood, Maple Valley, Marysville, Mercer Island, Mill Creek, Monroe, Moses Lake, Mount Vernon, Mountlake Terrace, Mukilteo, Newcastle, Oak Harbor, Olympia, Othello, Pasco, Port Angeles, Port Orchard, Port Townsend, Poulsbo, Pullman, Puyallup, Redmond, Renton, Richland, Sammamish, SeaTac, Seattle, Sedro-Woolley, Selah, Shelton, Shoreline, Snohomish, Snoqualmie, Spokane Valley, Spokane, Sumner, Sunnyside, Tacoma, Toppenish, Tukwila, Tumwater, University Place, Vancouver, Walla Walla, Washougal, Wenatchee, West Richland, Woodinville, Yakima and all other cities in WA - The Evergreen State.